Dashi, if you’re not familiar, is the deeply umami Japanese broth used to make ramen. Traditionally, it’s made with some fishy ingredients. Literally. Here, we’re simply making a veggie broth, with a healthy dose of kombu, for a slight taste of the sea, and miso, for that fermented deliciousness. I’m going to be posting a whole ramen recipe in just a bit, but I wanted to get the party started and get this broth up first. And you should totally read up more on dashi, its history and technique is definitely worthy of reading about in more than the few sentences I can afford to do here. But why make your own broth? There are so many varieties available in the supermarket these days, that simmering your own can seem like a hassle. And maybe, compared to simply grabbing some off a shelf, it is. But creating your own scratch-made broth has many benefits. Not everything should be overlooked in the name of convenience! So here are my top 10 reasons for making your own broth. Taste is a great place to start. Plenty of pre-made broths taste anywhere from “just fine” to “pretty darn good.” But homemade is simply just better. Fresher, more aromatic, and endlessly customizable to your taste. Make it as salty as you like, add different veggies, more or less garlic, and on and on. And if taste isn’t incentive enough…. I know that you occasionally have an onion laying around, beginning to sprout. Or a few carrots just languishing in the fridge. And how about that last little nub of ginger that will probably wither away eventually. That is (almost) all you need to make this vegetable broth. So let’s just say it’s practically free. Less packaging and less processing…these things are all great for the planet. We need a planet so that we can do fun things like make vegetable broth! There is a definite difference between being in a home that has a veggie broth simmering on the stovetop, it’s gentle aroma filling your senses…and being in a home that has bubkis. But honestly, the process of making the broth will improve your mood drastically. From the scent to the sense of accomplishment when sipping your soup, the therapeutic benefits are unsurmountable. 1) One Passover, not long ago, I spent the day making a metric tonne of broth for the Matzoh Balls. Once it had cooled on the stovetop, my mom threw it out thinking it was garbage. What the hell, mom? OK, so moms tossing out your creation aside, I’m assuming you’re now completely on board. Find a relaxing time, when you have plans to read or watch a movie or troll the internet or whatever, and then get brothing! ~I prefer to use cheesecloth to strain the broth because that means you can squeeze the boiled veggies and get every bit of flavor, while still having a nice, translucent broth. But if you don’t have it/don’t want it, then don’t worry! Just use a fine mesh colander, and let the veggie drain over a pot. ~This recipe is for a miso dashi broth, but if you leave out the miso, it’s still a really yummy broth! In fact, if you leave out the miso AND the kombu, it’s still delicious. Again, it is endlessly customizable. Add fresh herbs, if you like, or extra garlic, or no garlic, or…you get the picture. ~You can leave the skin on the onion since everything gets strained. It actually may increase the golden hue of the broth in the end. You don’t have to peel the ginger or garlic, either. Fun. ~Mirin is an ingredient I always have around. It’s a sweet rice wine that just makes flavors pop. I use it most often in stirfries, but it definitely adds a depth to the broth. However, you can totally leave it out. Again: customizable. Preheat a large pot over medium-high heat. Saute the onion and garlic in oil with a pinch of salt for about 5 minutes, just to get a little caramelization going. Add the carrots, ginger and water. Cover and bring to a boil. Once boiling, leave the lid slightly ajar so that steam can escape, and lower heat a bit, simmering to reduce by about 1/3rd. After about 30 minutes, add the kombu. Let cook an additional 30 minutes or so, removing the kombu at this point so that it doesn’t get slimy. All said, it should simmer for a little over an hour, and reduce to 8 cups. Add the mirin, miso and salt and stir. Let simmer for an additional 2 minutes, then turn off the heat. Place a separate pot, large enough to manage 8 cups of broth, in the sink. Place a handled strainer so that it sits securely on top of the pot (as pictured). Line with a few layers of cheesecloth with plenty of overhang. Pour in the vegetables and broth and let strain for about 20 minutes. Once cool enough to handle, bunch up the cheesecloth and squeeze, so that the vegetables release as much moisture and flavor as possible. Taste for salt again, and now your broth is ready to use! Freeze in tightly sealed plastic or glass containers for up to 3 months, if not using within the week. I’ve been watching “The Mind of a Chef” about David Chang of Momofuku on Netflix and I swear 90% of the shows are about ramen. Almost all of them are seafood, chicken, and pork-based broths and soups, so a solid vegan recipe is going to make me such a happy camper. I have been craving noodle soups for a week straight now, so I am super stoked about this and the coming full recipe! THANK YOU! That story of your mom is sad/hilarious! My husband has also thrown my food away thinking it was garbage so I feel your pain. Question on miso– are you calling for white miso to keep the broth light or can I use another type of miso without affecting the taste? I like the broth light, but any miso you love will work! It will, of course, affect the taste just because all misos taste different and some are stronger/saltier than others. I bet red wine miso would be amazing. My kombu comes roughly in 2″ x 6″ strips. What are your “sheet” measurements? How many strips would you put in? I always add my miso to the bowl and whisk in my broth at serving time this means the miso doesn’t over heat and lose any of its goodness. Can you reuse the kombu? If so, do I freeze it or dehydrate it again? Kombu is essential to a traditional ramen broth. But nothing about ramen has to be traditional except noodles that stay chewy when added to soup and a broth that coates the noodles as its pulled to you mouth. Kombu ships well, go online and get a cheap packet. Don’t reuse. Once used natural occuring glutamanes will have been used up an that is their purpose, natural msg. Tskumen ramen is ramen that you dip into thinkened soup. 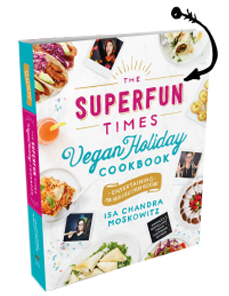 That benefits vegan recipes because you can supercharge flavors which makes the loss of animal less dramatic. I had an adventure making this yesterday. I took a trip to H-Mart, a Korean supermarket chain (really fun place if you can get past the dead sea creatures). I couldn’t find Kombu in the seaweed aisle, and a quick Google search told me Kombu is a Japanese name. A few more searches told me that Kombu is a dried kelp, so I selected one of the dried Kelp packages (and since there were broth directions on the back, I figured it was a safe bet). When I got home and opened it, it wasn’t in sheets, it was a folded, 3-foot long ‘leaf’ of seaweed. It was unexpected, but kind of cool. So, anyone who can’t find Kombu, look for dried Kelp sheets instead. I have Kombu powder. How much powder would you recommend? Sorry, I have never used kombu powder. Can you add an equivalent weight measurement for Kombu? I always see it sold in thick strips, not sheets. I’d never made stock before and I LOVED IT! My apartment smelled great, and I got rid of all those “forgotten” herbs and veggies in the fridge. I followed the directions to the letter, but also added cilantro, more carrots, celery and a sliced jalapeno. Very tasty and very easy. I’m looking forward to assembling the grilled ramen bowl tonight! I was looking around on your site for a vegetarian broth, but could not find it. Do you have a recipe for a vegetarian broth, or this is it? 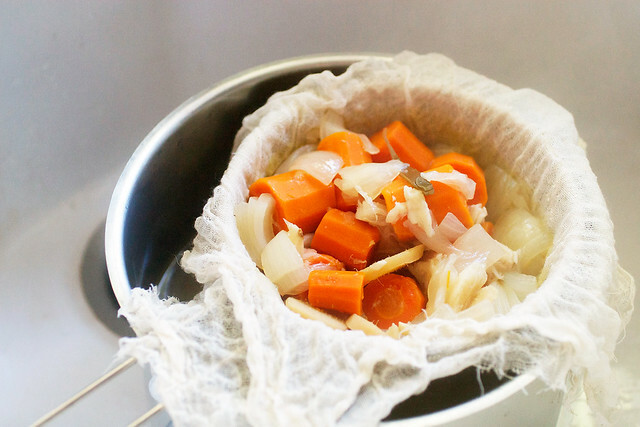 I save scraps from when I cook in the freezer and when bag gets full I make a broth…love your recipes! Just made this broth (along with the full ramen recipe) for dinner last night and it was truly fantastic and extremely easy. I found I needed a bit more miso to bring the saltiness up, but otherwise it was delicious! If you are know that the most useful features that i have seen in this free online minesweeper games then you have to get more idea to play this game and in this game you have to first see that you have to place the dice in right one otherwise the dice should be blast. In any case, truly, the way toward making the juices will improve your state of mind radically. From Do My Homework For Free aroma to the feeling of achievement while tasting your soup, the restorative advantages are unsurmountable. Miso stock is never under any circumstance made with just miso. It generally utilizes dashi (shaved/powdered/fluid from fish) and quite often has either tofu and additionally Negi (green onions). assignment writing help – assignmentdoer.com. In case you’re vegan, despite everything you’ll require some type of enhancing to supplant the dash since miso itself does not have enough flavor for the soup to be lovely. I don’t know what to propose, however – in Japan, some type of fish stock, as well as seasoning, is fundamentally constantly utilized.